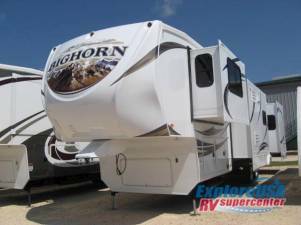 Bighorn Fifth Wheel by Heartland RV w/Rear Queen Bed Slide, Wardrobe Slideout, Angle Shower, Lav., Private Toilet Area, Dinette w/2 Chairs, Pantry, Slideout Dbl. Kitchen Sink, Overhead Cabinet/3 Burner Range/Pantry & Refrig. Slide, Step Up to Front Living Area w/Front Wall Ent. Center & Storage, L-Sofa Slide, Opposite Sofa Slideout and Much More!